Marcos Alonso signs new Chelsea deal until 2023 – Royal Times of Nigeria. 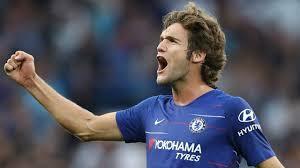 Spain defender, Marcos Alonso, has signed a new five-year contract at English Premier League club, Chelsea.The left-back has enjoyed an excellent season thus far, and has now put pen to paper on a new deal until 2023. Since joining the club from Fiorentina in 2016, Alonso has made ninety-two appearances for the club, scoring fifteen goals and providing eleven assists, both as a wing-back and a full-back. The twenty-seven-year-old has been a key part of the club’s recent Premier League title win and their FA Cup triumphs, to the point where he made his Spain debut during his time at the club. He has since gone on to win three caps for La Roja, having made his bow in March of 2018.